A few months ago, a magazine contacted me. They wanted recipes with chocolate and it would be followed with a photoshoot. As long as you follow the rules of working with chocolate, the going will be good. 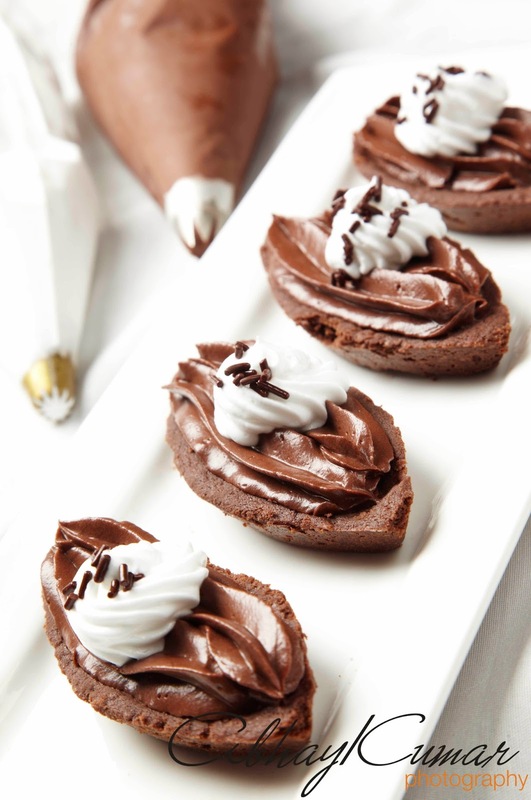 These ganache tarts are easy to make. The pastry is soft and has the tendency to crumble. Chill it for a bit and then roll it out, cut it and line your tart pans with it. I baked my tarts in boat shaped moulds, the usual scalloped moulds should be fine for these tarts. Another suggestion is to make the ganache filling a day earlier so that the tarts can be assembled on the day the pastry is baked. To make the ganache, heat the cream and sugar in a saucepan till it just reaches a boil. Remove from heat and drop in the chocolate pieces. Do not stir. After 5 minutes, add in the butter and gently stir the contents till smooth. Leave to cool, then refrigerate for about 6 hours. Whip it with an electric beater till light and fluffy. Make the pastry by sifting flour, cocoa and salt into bowl. Place butter and sugar into a mixing bowl, cream till fluffy. Fold in the sifted flour mixture and use enough egg to bind it all together. Wrap in clingfilm and chill the dough for about 30 minutes. Roll out the pastry between two sheets of plastic. Use a cutter to cut out circles about 1/2" larger than your tart moulds. Fit the pastry into the moulds, prick the bases with a fork and chill for about 20 minutes. Place all the moulds on a baking sheet and bake in a preheated 180°C oven for about 15- 20 minutes or till the edges of the shells are cooked. Remove from the oven and when they are cool, unmould carefully. To assemble, put a star nozzle into a piping bag, fill with ganache. Put a star nozzle into a second piping bag and fill with whipped cream. Pipe the ganache into the tart shells, pipe a cream rosette over it. Decorate with chocolate rice or almond flakes. The filled tarts can be refrigerated.